Throughout our history, MUA has strongly maintained its double mission: strengthening of Latina immigrant women and activism in defense of immigrant rights and social justice. 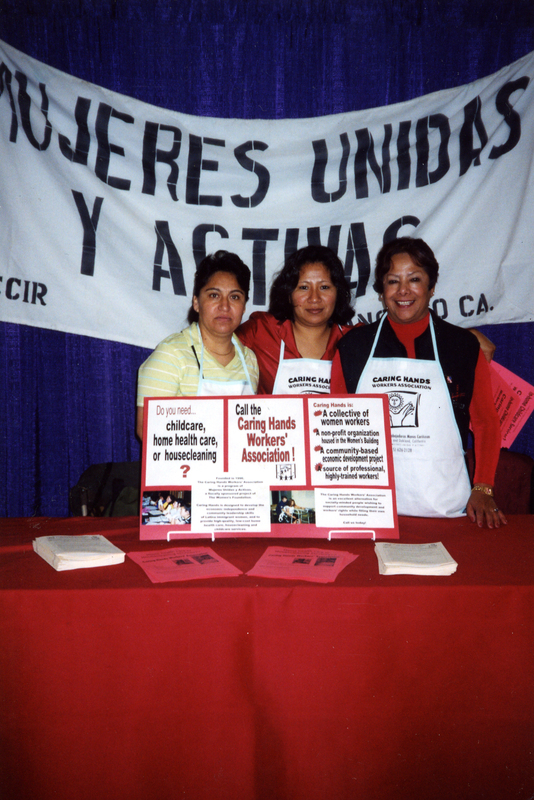 Many organizations and communities around the country recognize MUA’s political work. 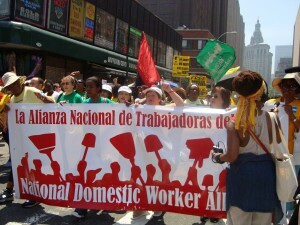 MUA has helped hundreds of women get out of domestic violence, become strong leaders and take an active role in the movement for immigrant’s rights and social justice. Everything that MUA has achieved since its founding is a result of the great commitment and sacrifices of our members. 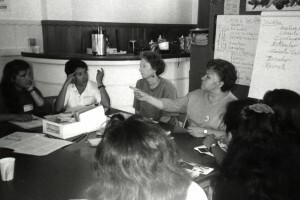 Many women have been members of MUA over the years and each one has left her mark on the organization. SFSU Social Work Students Chris Hogeland and Karen Rosen recruit local immigrant leaders Clara Luz Navarro and Maria Olea to interview 345 Latina immigrant women for the “Dreams Lost/Dreams Found” study sponsored by the Immigrant Women’s Task Force of the Northern California Coalition for Immigrant Rights (NCCIR). Navarro and Olea join with 8 study participants to found Mujeres Unidas y Activas, a project of NCCIR, holding weekly meetings, graduating 14 women from our first leadership training, and launching a popular theater project that informs the community about AIDS, domestic violence, and immigrant and workers’ rights. MUA wins protections for immigrant women survivors in the federal Violence Against Women Act (VAWA), mobilizes against anti-immigrant Proposition 187, rallies against devastating national proposals for welfare and immigration reforms, successfully fights against Pete Wilson’s attempts to eliminate immigrant women’s right to prenatal care. MUA launches Caring Hands in 1994 to build immigrant women’s economic security. 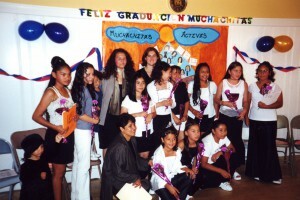 MUA achieves its dream of opening its second office in Oakland, organizes trainings with parent leaders of the Chinese Progressive Association, wages a successful campaign to improve immigrant parents’ rights in the San Francisco school district, and begins offering technical assistance through the Family Violence Prevention Fund. 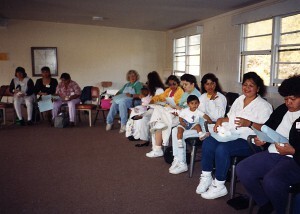 NCCIR closes its doors and the Women’s Foundation of California becomes MUA’s fiscal sponsor. 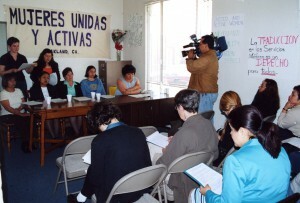 MUA initiates a strategic planning process, launches Muchachitas Activas, a leadership program for the daughters of MUA members, implements a new leadership training curriculum, and organizes a community campaign to bring attention to the inadequacies of translation services in Alameda County hospitals and clinics. 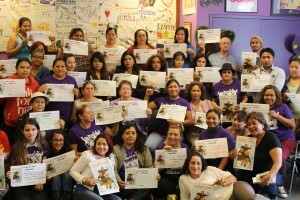 MUA completes its two-year strategic planning process, selects its first Board of Directors, becomes an independent 501(c)(3) organization, trains fifty members each year to work as Peer Counselors, Group Facilitators, and Community Organizers, and leads our first statewide legislative campaign for Domestic Worker Rights (AB2536) which passes through the California legislature only to be vetoed by the Governor. 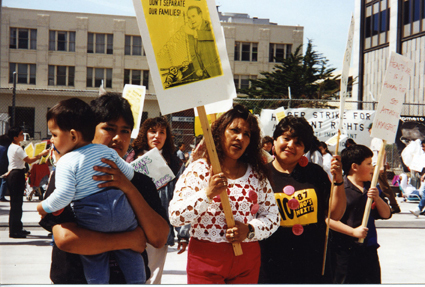 MUA responds to increased immigration raids by founding Oakland Sin Fronteras, joining the San Francisco Immigrant Legal Education Network, hitting the streets in protest and increasing community education efforts. 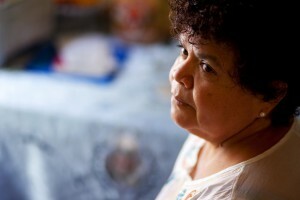 MUA also releases Behind Closed Doors, a report uncovering the rampant abuses in the domestic worker industry in California, joins 12 other organizations in founding the National Domestic Worker Alliance (NDWA), is elected to serve as NDWA’s fiscal sponsor and Coordinating Committee member, and organizes the first West Coast Household Workers Congress for 300 workers representing 20 organizations. MUA expands our staff, membership, budget, and offices, launches a new Grassroots Fundraising Program, and completes a second strategic plan. MUA provides services to thousands of women each year through new collaborations with Ruby’s Place and the launch of our new Spanish-language ALMA crisis line. 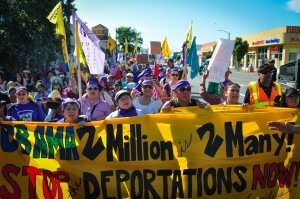 MUA’s organizing efforts span from the local to international levels as we successfully spearhead efforts to win the California Domestic Worker Bill of Rights, pass the Trust Act to end the Secure Communities program and ICE-Police collaboration in California, co-found and co-anchor ACUDIR, fast and march to demand a Pathway to Citizenship for all immigrants and end to the deportations, and vote to approve an International Convention on Domestic Worker Rights at the International Labor Organization. 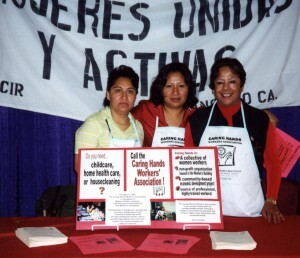 MUA leads statewide efforts to engage 10% of the state’s domestic workers in our movement and implement our Domestic Worker Bill of Rights via our Dignity in Action education and enforcement campaign reaching hundreds of workers through street outreach and the formation of our new Comite Semillas in communities such as Concord, San Jose, and Hayward; expand in efforts to ensure language access in San Francisco; prepare our members to obtain licenses via AB 60 and get ready to support thousands of members and their families to apply for administrative relief via DAPA. MUA’s Peer-led domestic violence and sexual assault programs continue to grow via new partnerships and the continuation of our peer-led counseling program. And MUA gets ready to celebrate our 25th anniversary!